Early Bird, General Admission and VIP tickets for the 18th edition of Ultra Music Festival in Miami will go on sale at 1:00pm on Tuesday, 29 September. Early Bird tickets will be available on a first-come-first-served basis, exclusively to fans that register before 12:01 am on 28 September. Three-day General Admission tickets will be available to purchase from $324.95, which is over $100 cheaper than a General Admission ticket to the March 2015 event. Once again, payment plan tickets will be available for the General Admission tickets. 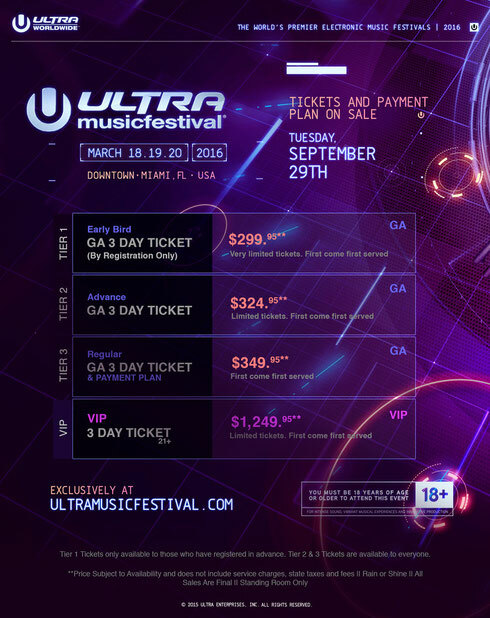 In a new move by event organisers, Ultra Music Festival held a flash ticket sale in May 2015, selling an unprecedented amount of Super Early Bird tickets, priced at just $249.95**. Demand for this next release is expected to be extremely high, so clubbers are advised to act fast to ensure their place at the event. Ultra Music Festival takes place one week earlier than usual in Downtown Miami, from March 18-20, 2016, and is an 18+ event.